Meat production falls in Cunene province. 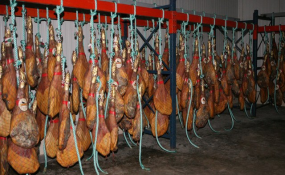 Ondjiva — About 293 tonnes of meat of different species were produced in 2018, in several slaughterhouses in the southern Cunene Province, which is less 40 tonnes in relation to the year 2017, said Tuesday in this city the director of the provincial farming department, Pedro Tiberio. Speaking to ANGOP, the official said that the production of this amount of meat resulted from the slaughter of 1,226 heads of cattle, 1,833 pigs and 2,021 goats, thus totaling 5080 heads of cattle. In his view, the decline in meat production was due to the scarcity of cattle in the local market, which is acquired in the farmers located in the municipalities of Cuanhama, Ombadja and Cahama. He said that the meat was marketed at the level of these municipalities markets at a price ranging from 1,000 to 1,500 kwanzas per kilogramme. Cunene is the second largest cattle-breeding province in the country, after Huíla, with about 1.1 million heads of cattle.